Sally Caldwell-Fisher (Born 1951) was born and raised with several siblings in Michigan. Her mother gave her watercolors at an early age. Her mother, also an artist, provided her with good materials to create her own art. Her art is greatly influenced by her mother. She graduated from the University of Michigan in 1972 with a degree in English. After graduation she started waiting tables and selling paintings to earn a living. In the early 1970s, Sally moved to New England where the life became her favorite painting subjects. 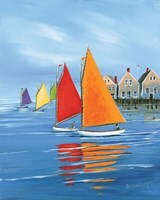 Her art has been featured in Traditional Home magazines U.S. Art, Romantic Homes, American Artist, and Art/Trends. Her art has also been shown on two Yankee Magazine covers. 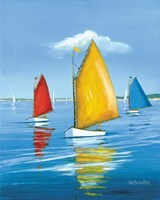 Sally designed the events posters for the Tall Ships, Quebec, America's Cup San Diego, and the America's Cup Newport. Her art is included in the permanent collections of the Mitsui Kagaku Corporation, Tokyo, The White House, MBNA, the Bruce Museum, Smithsonian Institution, Exxon of Japan, and Panasonic of Japan. 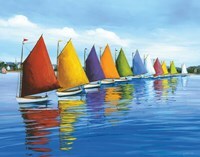 Her "Rainbow Cats" painting was chosen to adorn the cover of the Decor magazine. 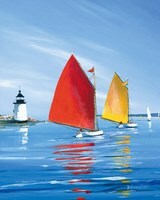 And her "Maine Regatta" painting was chosen to be the poster for the Wooden Boat Show in Mystic, Connecticut (2007). Sally collects old photographs of coastal buildings and life as she took much inspiration from them. 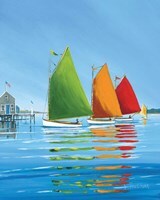 She was commissioned to do an original painting for the Wooden Boat Show in Mystic, Connecticut (2008). Sally says that over the years, her style has evolved consistently, as she has also evolved. She also says that openness and change are essential to the creative spirit. She can never adequately describe her art because it defies easy categorization.